Could your complexion use a little refreshment? 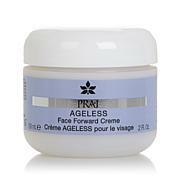 This cream moisturizes skin and works to provide a smoother and more youthful appearance, with continued use. 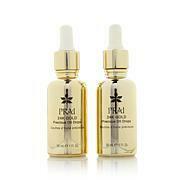 Awaken a more beautiful version of yourself with the age-defying powers of Prai. Ingredients: Aqua/Water/Eau, Dimethicone, Caprylic/Capric Triglyceride, Butyrospermum Parkii (Shea) Butter, Glyceryl Stearate, PEG-100 Stearate, Cetyl Alcohol, Butylene Glycol, Cyclopentasiloxane, Vitis Vinifera (Grape) Seed Oil, Jojoba Esters, Helianthus Annuus (Sunflower) Seed Oil, Sorbitan Stearate, Potassium Cetyl Phosphate, Coco-Caprylate/Caprate, Talc, Phenoxyethanol, Zingiber Cassumunar Root Oil, Cetearyl Olivate, Sorbitan Olivate, Maltooligosyl Glucoside, Dimethicone/Vinyldimethicone Crosspolymer, Hydrolyzed Soy Protein, Perfluoroperhydrophenanthrene, Perfluorodecalin, Perfluorodimethylcyclohexane, Perfluorohexane, Saccharina Longicruris Extract, Tetrahexyldecyl Ascorbate, Tocopheryl Acetate, Retinyl Palmitate, Glycerin, Silica, Hydrogenated Starch Hydrolysate, Carbomer, Mica, Sodium Hydroxide, Potassium Sorbate, Sodium Benzoate, Fragrance (Parfum), Amyl Cinnamal, Benzyl Salicylate, Citronellol, Hexyl Cinnamal, Butylphenyl Methylpropional, Limonene, Alpha-Isomethyl Ionone, Tin Oxide, Titanium Dioxide (CI 77891), Iron Oxides (CI 77491), Yellow 5 (CI 19140), Red 33 (CI 17200). 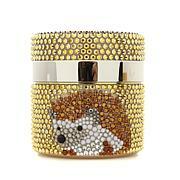 LOVE, LOVE this face cream. This is my third. This makes your skin feel smooth and uplifted! Love prai! Great addition to my PRAI regimen! Been using this with the oxygen infusion eye gel and they are both super. 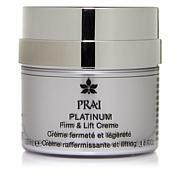 Definitely a nice addition to the PRAI lineup I'm using which includes the 24 K wrinkle repair creme. 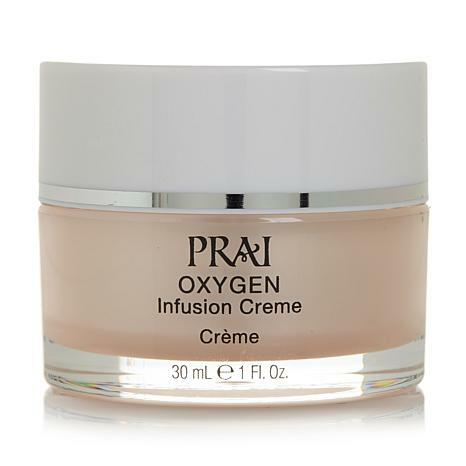 The Prai Oxygen Infusion Face Crme goes on so soft and smooth and doesn't leave your face feeling oily or heavy. You feel moisturized and fresh and radiant looking!